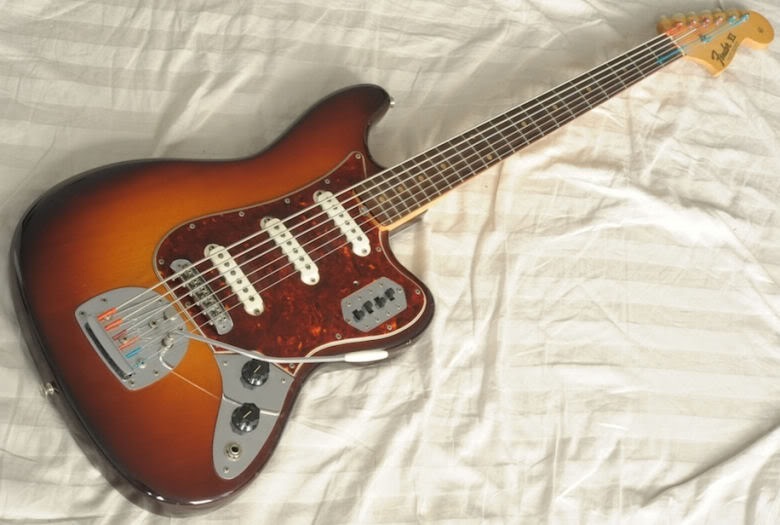 Although referred to as The Fender Six String Bass, Fender actually named this guitar, The Fender VI. In the late 1950’s, the Danelectro Company developed the first six string bass guitar called the model UB2. Many recordings during the late 1950’s through the 1960’s featured this Danelectro six string bass, played with a pick with the high end accentuated. The sound was refered to as Tic-Tac, and the tic-tac bass was a new arsenal to add a special sound to recorded popular music. Some players strung these basses with extra heavy guitar strings and tuned down a fifth to get a baritone guitar sound. 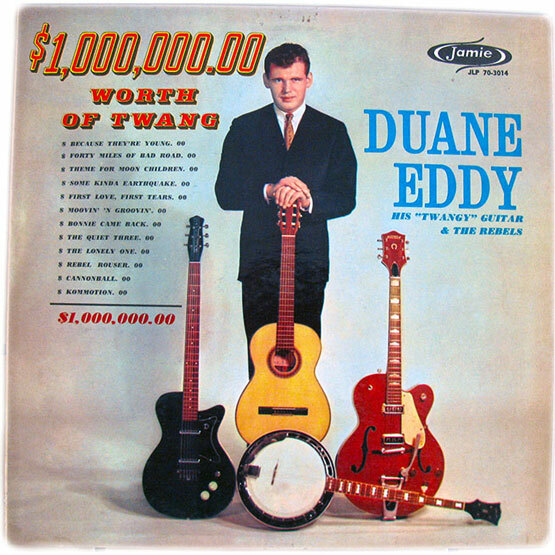 Duane Eddy specialized in this sound and he used a Danelectro instrument. In 1961, Leo Fender believed he could build a better instrument. 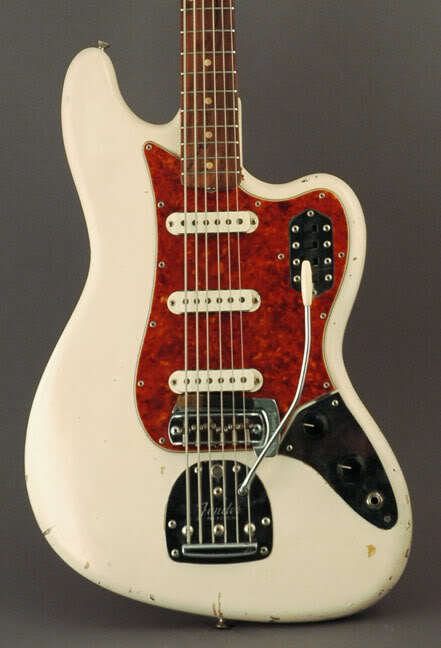 Fender designers used a body pattern similar to a Fender Jazzmaster, however the upper horn had more of a curve. The first model employed three single pole passive pickups with metal pickup rings and three single throw switches to turn each on or off. The neck had a 30” scale and a 7.25” radius. By bass standards, the neck was extremely thin. 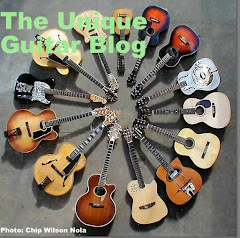 The guitar was equipped with a Fender Floating Tremolo that had a long arm. The adjustable bridge came with a removable Chromed cover. 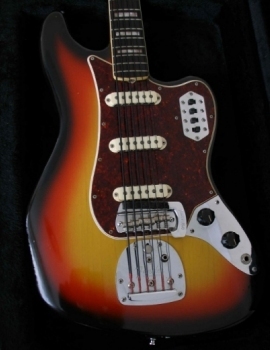 The body included a large pickguard and an input, master volume and tone control that were mounted on a chrome plate. Leo Fender intended this to be a bass guitar tuned an octave below regular guitar pitch. The wound first string in the set had a .025” diameter. Because the strings were wound, the tone was quite different from that of a guitar. The tuning was much different from modern five or six string basses, which extend beyond low E.
The close proximity of the strings and the narrow neck did not win any praise from most bass players, although a few did use it in performances. 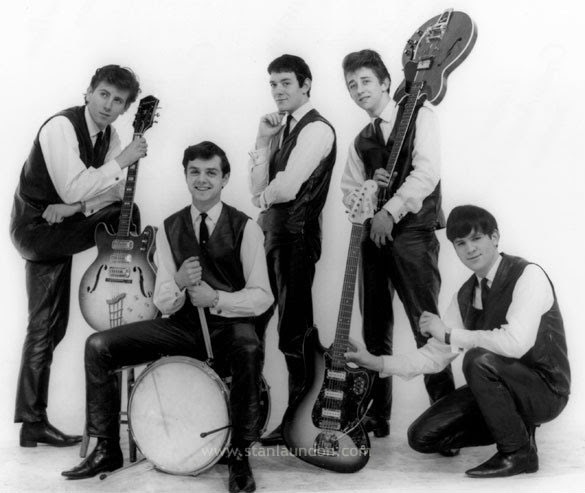 Notably Jack Bruce, John Entwhistle, Robert Stiles of the Hollies and Rick Huxley of the Dave Clark Five. Robert Smith of The Cure and other such as Glen Campbell utilized it as a lead instrument. The Fender VI was an excellent crossover instrument for guitarists. 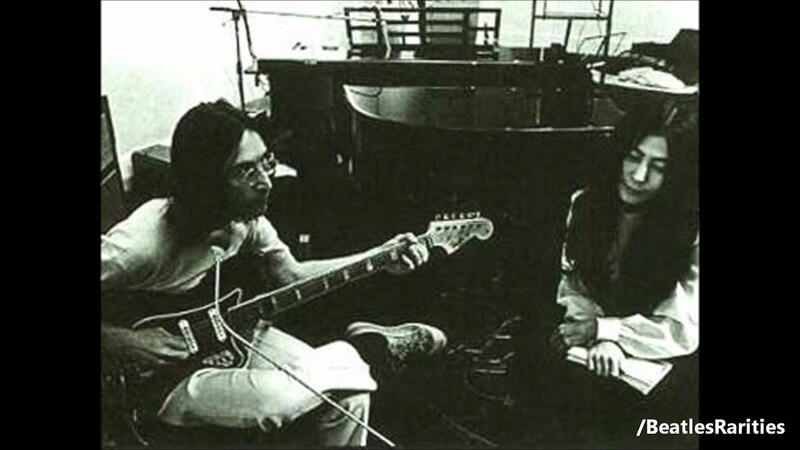 Harrison and Lennon both utilized it on their recordings. It is easy to play chords on this instrument and the short scale helps guitarists that are used to guitar necks as opposed to bass necks. The tremolo bar on this instrument did not win many fans and did not receive much use. Though well designed, the Fender VI was not at all popular. From its inception to its demise, less than 800 units were manufactured. 1963 brought about a change in the instruments design when a “strangle” switch was added to the lower horn. This condenser boosted or cut the bass frequency to help provide that Tic-Tac sound or a deeper bass sound. A foam rubber muffler became part of the guitars equipment and was located right above the bridge. A flick of a spring-loaded switch pressed the rubber mute against the strings. A modification to the pickups also came about. 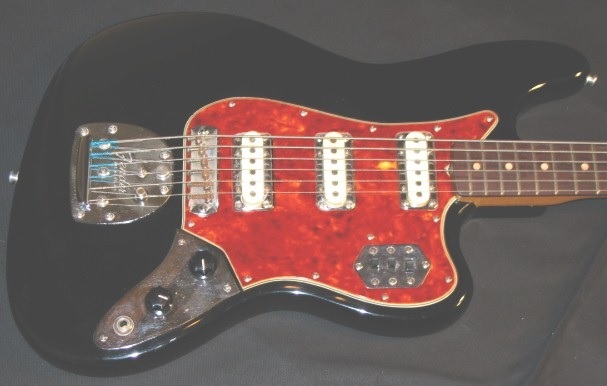 The metal rings were gone and the pickups resembled those found on a Fender Jaguar, although the VI still came with three pickups. The capacitor/condenser switch carried over from the Jaguar design. Although Mr. Fender meant for this instrument to be an actual bass, many guitarists set it up as a baritone guitar and tuned it from A to A or B to B, using extra heavy guitar strings. 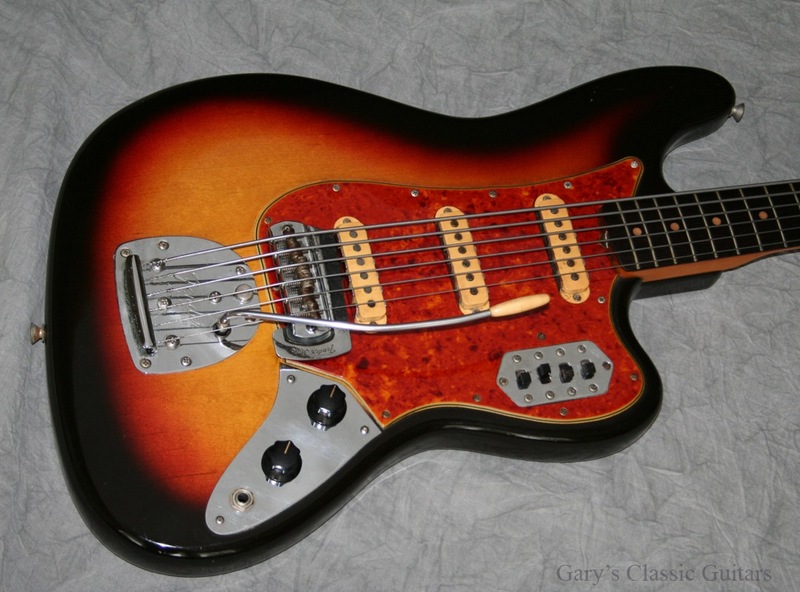 In 1964, a plastic pickguard replaced the celluloid one. A bound neck became standard equipment in 1965. In late1966, block inlays were added. In 1968 the headstock logo with printed with black ink instead of gold ink. Additionally a polyester spray-on finish, replaced the nitrocellulose finish.1975 brought about the discontinuation of the Fender VI. During Fender’s transition years, all manufacturing moved to Japan. 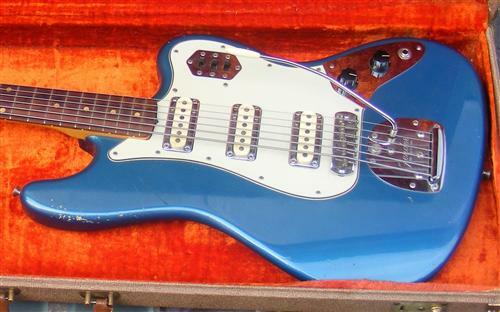 In 1996, a ’62 reissue of the Fender VI was offered. One of the main downfalls of the Fender VI was price. A Stratocaster sold for $239 and a Precision bass sold for around the same amount. However, the Fender VI was priced at $400. Though the Fender instrument was far superior to the Danelectro six-string bass, the Danelectro model, priced at less than $150 in 1961, was more popular. Guitarists saw this as a side instrument and were not willing to spend the extra cash. There were several differences in this guitar. The body had a Jaguar shape. It came with only two pickups with Jaguar switching options and the neck scale was 28.5”. The bridge was fixed instead of having a tremolo. 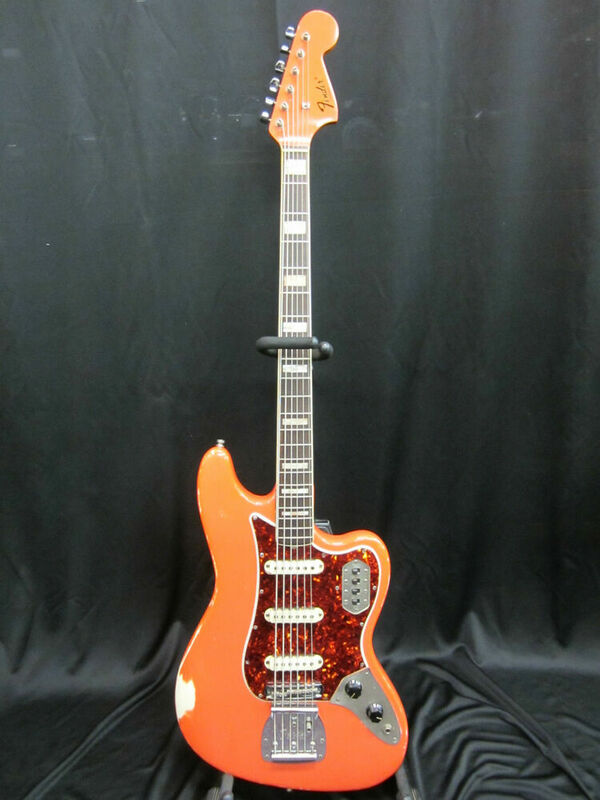 In 2006, the Fender Custom Shop offered a reproduction of the original 1961 Bass VI featuring three single-coil pickups and identical electronics. At present, Fender no longer offers the Fender VI. 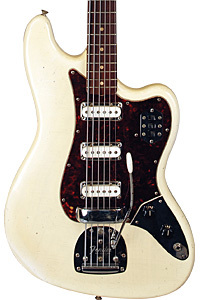 One offshoot of the Fender VI was the Fender Jaguar guitar which was introduced in 1962. Errrmmmm... Robert Smith of The Cure was never a bass player as such. He did use the Bass VI extensively but it was used as a guitar to play lead lines. Thanks G.L. Your comment is duly noted and the text has been updated to reflect this. The six string bass/baritone guitar has played an important part in rock music. Of course, the Dan-O had a much better sound even for soloing like Rene Hall used it for. In professional use, it wasn't price. And, though Glen Campbell is shown with a Bass VI on that Witchita Lineman video, in the original recording its a Dan-O. He borrowed it from Carol Kaye that day. I realize this is an older post, but here's an update: Fender has reissued the Bass VI in their pawn shop series, and Squier also as of 2013 has a very affordable version with 3 single-coils.